WASHINGTON—The day was cold and rainy, but the mood of the thousands of marchers at the 35th annual March for Life on Jan. 22 in the nation’s capital could not have been more optimistic and spirited about the rights of the unborn. According to a recent study conducted by the Guttmacher Institute, a Planned Parenthood affiliate based in New York, pro-life supporters have reason to feel optimistic. The number of abortions declined to 1.2 million in 2005, a figure that is 25 percent below the 1.6 million abortions in 1990 and is the lowest level reported since 1.179 million in 1976, according to a study released on Jan. 17. The Guttmacher Institute report also shows the abortion rate, the number of abortions per every thousand women ages 15 to 44, was down to 19.4 for 1,000 women—the lowest it has been since 1974. Benedictine Sister Cathy Anne Lepore, a religion teacher at Roncalli High School in Indianapolis who took part in the national March for Life for the ninth time, credits devotion to prayer as a top reason that the pro-life movement has seen gains in recent years. Andy Proctor, a seminarian at the Bishop Simon Bruté College Seminary at Marian College in Indianapolis, agreed. “Prayer is so important. In the Gospels, Jesus uses prayer as his daily bread. It’s an integral part of God,” said Proctor, who is a member of Our Lady of the Greenwood Parish in Greenwood. 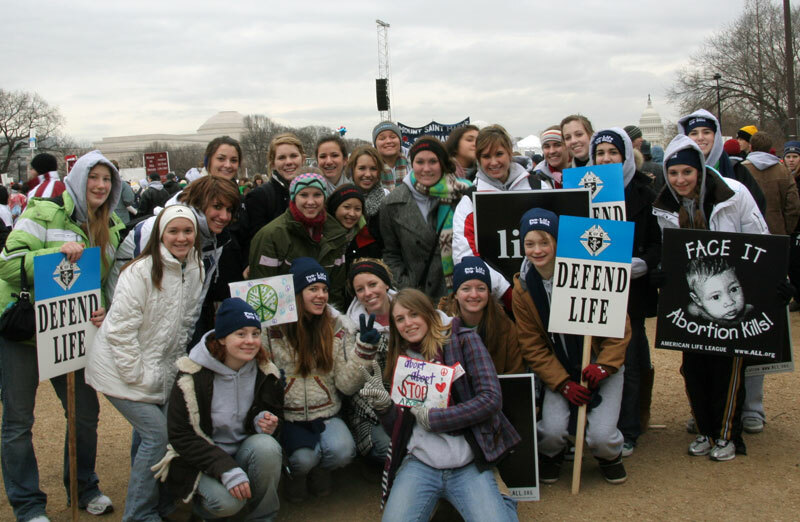 Another key element helping the pro-life movement gain momentum in recent years is the tireless work done by a new generation of young people who are excited about working for life in all of its forms, Sister Cathy Anne said. Sister Cathy Anne thinks it is part of a generational shift back to a more moderate thought process. Father Jonathan Meyer, archdiocesan director of youth ministry, thinks many young people look at abortion on an individual level. 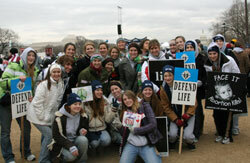 The Archdiocese of Indianapolis sent more than 500 representatives to Washington for the march. This included high school students, priests, seminarians, women religious, teachers, youth ministers, parental chaperones and Marian College students. Tens of thousands of people, mostly teens from around the country, participated in the march, which started at the National Mall, continued along Constitution Avenue and concluded at the Supreme Court building on Capitol Hill. “The crowds were enormous,” said Servants of the Gospel of Life Sister Diane Carollo, director of the archdiocesan Office for Pro-Life Ministry, who worked with Father Meyer on arrangements for the March for Life pilgrimage. Many in the pro-life movement have credited the Church for its improved teaching methods and pro-life message on this new generation of young people. Michelle Culver, 17, a member of St. Thomas More Parish in Mooresville, credits her parish for educating her about the facts of abortion. “The things I have learned through my Church and through my youth minister, Marianne Hawkins, have been a huge influence on me,” Michelle said. The challenge for march participants and other pro-life advocates remains to continue this momentum and expand it into their everyday lives. One of the ways they can help with this effort is by attending the Archdiocesan Pro-Life Youth Council’s spaghetti dinner and movie from 6 p.m. to 9 p.m. on Feb. 22 in Priori Hall at Our Lady of the Most Holy Rosary Parish, 520 Stevens St., in Indianapolis. The cost is $10 per person. The dinner program’s focus will be on the late Pope John Paul II and his ministry. During the program’s intermission, Pro-Life Youth Council members will show a documentary showcasing this year’s pilgrimage to the annual March for Life in Washington. Archdiocesan participation in the pro-life pilgrimage went extremely well again this year, Sister Diane said, because of the dedicated volunteer service of the priests, bus captains, teachers and youth ministers. Although there continues to be a struggle to protect life as a result of the Supreme Court’s Roe v. Wade decision that legalized abortion on demand in the United States 35 years ago, Father Meyer sees an end to this injustice on the horizon. He also sees a movement that will continue to grow in numbers and support because of its message of respecting and protecting life for everyone.